I started a new job in November, and I’ve really enjoyed getting to know my new co-workers. We had our office Christmas party this week and the food was nothing short of fabulous. On the menu? Macaroni and Cheese is the dish I don’t fix at home often, but really look forward to eating during the holidays. It was cooked perfectly, crunchy on top and cheesy throughout. The tomato casserole was very interesting and a dish I’d never heard of, much less tried. It had bacon and cheese in it and I’m going to attempt to recreate it (that’s a post for a later date). Have you ever seen asparagus thinner than a pencil? There’s nothing I despise more than going to the grocery store to buy a vegetable like asparagus and it’s not plump. This asparagus was full and round and had a nice bite to it. My white elephant gift. I’m all about anything festive! It was a delicious meal indeed. The only thing I would’ve added is a nice blackberry reduction sauce to the cheesecake. 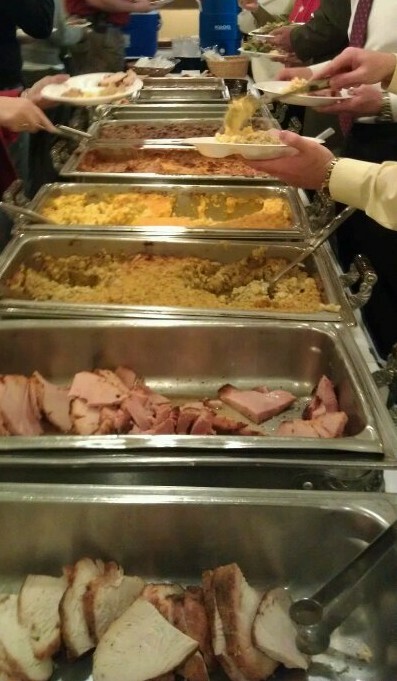 A shout out to Eagle Dining Services for catering a wonderful holiday luncheon! After we ate, our team had a white elephant gift exchange which was rather entertaining with 40 folks. Since I drew #17, I got to choose whether I wanted to take someone else’s gift or pick a gift from under the tree. I decided to take someone’s Cabernet Sauvignon and should have known I wouldn’t get to keep it. The next gift I opened was a set of kitchen knives and since I already have a fine set at home, I talked another co-worker into a trade at the end of the game. 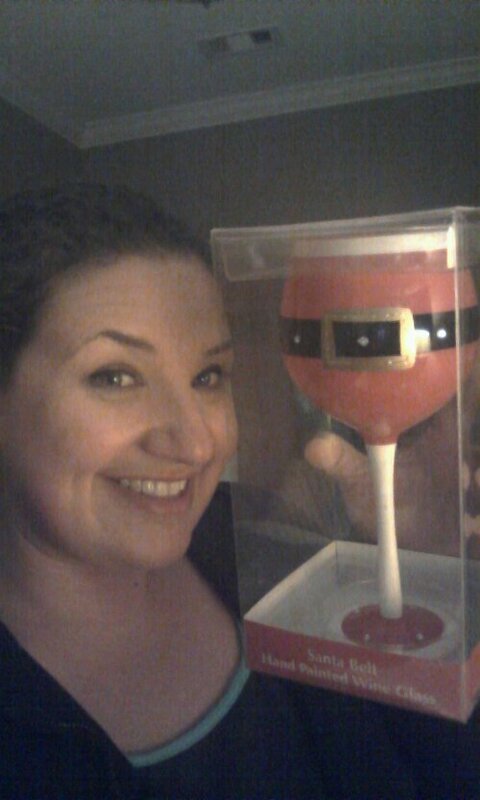 I came out pretty good with a Santa Claus inspired wine glass. Hey, at least it’s something I can use! Among the most popular gifts? Wine, lottery tickets and a Georgia Southern University Gnome. We had lots of laughs and a great time was had by all.